The Revised Standard Version Catholic Edition is an English translation of the Bible first published in 1966. In 1965, the Catholic Biblical Association adapted, under the editorship of Bernard Orchard OSB and Reginald C. Fuller, the Revised Standard Version (RSV) for Catholic use. It contains the deuterocanonical books of the Old Testament placed in the traditional order of the Vulgate. The editors' stated aim for the RSV Catholic Edition was "to make the minimum number of alterations, and to change only what seemed absolutely necessary in the light of Catholic tradition." The Psalms preserved the numbering of the RSV (which reflects the Masoretic numbering), accompanying it with the Septuagint numbering system in brackets, in line with the New Vulgate, which is the official Latin version for the Catholic Church. Noted for the formal equivalence of its translation, it is widely used and quoted by Catholic scholars and theologians, and is used for scripture quotations in the Catechism of the Catholic Church. The RSV is considered the first ecumenical Bible and brought together the two traditions – the Catholic Douay-Rheims Bible and the Protestant Authorised Version. Today, the original 1966 edition of the RSV-CE is still published by Ignatius Press, Scepter Publishers, Oxford University Press, and Saint Benedict Press. The Revised Standard Version (RSV) stands within the tradition of the Authorized (King James) Version (KJV), which was updated in 1885 in the UK as the Revised Version, with an American edition known as the American Standard Version published in 1901. The latter version was revised in 1952 by a Standard Bible Committee authorized by the National Council of Churches; this was known as the Revised Standard Version. A revision of the Apocrypha was authorized in December of that year, and would be completed in 1957. The 1943 encyclical of Pope Pius XII, Divino afflante Spiritu, encouraged translations of the Catholic Bible from the original languages instead of the Vulgate alone, as had been the tradition since the Council of Trent. "It was in fact with a view to filling this rather obvious gap in the shortest possible time that some Catholic scholars considered the possibility of so editing the Revised Standard Version, on its appearance in 1952, as to make it acceptable to Catholic readers." In 1954, after a year of negotiations, the Standard Bible Committee granted the Catholic Biblical Association of Great Britain permission to print a Revised Standard Version Catholic Edition (RSV-CE) Bible. Originally, the RSV-CE New Testament was to have been issued as early as 1956, but Cardinal Griffin, who had approved the plan, died before he could give it an imprimatur. A delay of nearly a decade ensued before Archbishop Gray of St. Andrews and Edinburgh gave the RSV-CE New Testament the necessary imprimatur. And so at last, in 1965, the RSV-CE New Testament was published. In the following year, 1966, the full RSV-CE Bible was published, with the deuterocanonical works incorporated into the Old Testament text. The apocryphal Prayer of Manasseh, 1 Esdras, 2 Esdras, 3 Maccabees, 4 Maccabees and Psalm 151, which are part of the Septuagint but not of the Catholic canon, were not added. A Catholic Bible differs in the number, order, and occasionally preferred emphasis than books typically found in Bibles used by Protestants. The Catholic Church declares: "Easy access to Sacred Scripture should be provided for all the Christian faithful. That is why the Church from the very beginning accepted as her own that very ancient Greek translation of the Old Testament which is called the septuagint; and she has always given a place of honor to other Eastern translations and Latin ones especially the Latin translation known as the vulgate." Not all the books in the Septuagint are included among those that the Catholic Church considers to be part of the Old Testament. On the other hand, the early Eastern translation known as the Peshitta excluded five New Testament books that the Catholic Church declares to be canonical. Translations used by Protestants typically use the shorter Masoretic Text as their basis regarding the Old Testament. The Luther Bible included what he called the Apocrypha and changed the traditional order of some of the New Testament books. the inclusion of the longer ending to the Gospel according to Mark (16.9-20). Some disputed verses or phrases that had been footnoted in the RSV were restored in the Catholic Edition (Luke 22.19-20; 24. 5, 12, 36, 40, 51-52). Footnotes regarding the value of New Testament coins were rewritten in terms of how long it took the average worker to earn the money (e.g. the denarius was no longer defined as "twenty cents" but as "a day's wage"). The book of Revelation, called "The Revelation To John", had added as a subtitle ("The Apocalypse"). Some of the changes made in the RSV Catholic Edition were later introduced into the RSV Second Edition of the New Testament in 1971 in preparation for the issuance of the RSV Common Bible. Cover of "The Ignatius Bible" (RSV2CE), designed by Christopher J. Pelicano, featuring Christ Pantocrator at the center and the Four Evangelists Tetramorph at the corners. In early 2006, Ignatius Press released the Revised Standard Version, Second Catholic Edition (RSV-2CE). 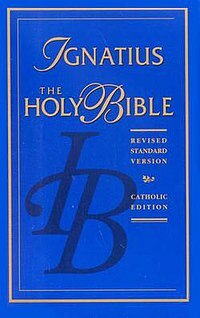 The Ignatius Edition "was revised according to [the norms of] Liturgiam authenticam, 2001" and "approved under the same [i.e. 1966] imprimatur by the Secretariat for Doctrine and Pastoral Practices, National Council of Catholic Bishops, February 29, 2000." To that end, Ignatius Press submitted its proposed revisions to the United States Conference of Catholic Bishops and to the Congregation for Divine Worship, making specifically-requested changes to those portions of the text in liturgical use as lectionary readings. As with the original RSV and its first Catholic edition, the translation copyright remains in the hands of the National Council of Churches. The RSV2CE is the basis for Ignatius Press' The Ignatius Catholic Study Bible: New Testament, and is likewise used in Midwest Theological Forum's The Didache Bible, a study bible with commentaries based on the Catechism of the Catholic Church. The Second Catholic Edition removed archaic pronouns (thee, thou) and accompanying verb forms (didst, speaketh), revised passages used in the lectionary according to the Vatican document Liturgiam authenticam and elevated some passages out of RSV footnotes when they favored Catholic renderings. For instance, the RSV-2CE renders "almah" as "virgin" in Isaiah 7:14, restores the term "begotten" in John 3:16 and other verses, uses the phrase "full of grace" instead of "favored one" in Luke 1:28, and substitutes "mercy" for "steadfast love" (translated from the Hebrew hesed) throughout the Psalms. As with the original RSV, gender-neutral language is not used when it has no direct referent in original language of the text. Many Catholic commentators, authors, and scholars use the RSV2CE, including Scott Hahn, Curtis Mitch, Steve Ray, and Jimmy Akin. Although the revised lectionary based on the New American Bible is the only English-language lectionary that may be used at mass in the United States, the Revised Standard Version, Second Catholic Edition has been approved for liturgical use in Ordinariate Catholic parishes for former Anglicans around the world. To that end, Ignatius Press has published a lectionary based on the RSV-2CE, approved for use by the Episcopal Conference of the Antilles and by the Congregation for Divine Worship and the Discipline of the Sacraments for use in the personal ordinariates. The Personal Ordinariate of Our Lady of Walsingham in the United Kingdom has adopted the RSV-2CE as "the sole lectionary authorized for use" in its liturgies. While copies of the RSV-2CE Bible are readily available from the publisher and via well-known commercial online retailers, the lectionary books for use at mass are not currently being sold except by sources within the Personal Ordinariate of the Chair of Saint Peter. The Book of the Gospels is also difficult to obtain. Parishes of the personal ordinariates have been obtaining Gospel Books from Africa, where the RSV-2CE was approved for use in several countries. ^ Revised Standard Version, Second Catholic Edition, "Introduction to the 1966 Edition"
^ "Dogmatic Constitution on Divine Revelation, Dei verbum". Vatican: Vatican. Retrieved 2015-01-21. ^ Examples of Septuagint books not granted canonical status by the Catholic Church are 3 and 4 Esdras, 3 Maccabees and 4 Maccabees. ^ See any book by Hahn (ICSB, The Lamb's Supper, Reasons to Believe), Mitch (ICSB, CCSS [NAB], A Study Guide for Jesus of Nazareth), Jimmy Akin (Fathers Know Best, Salvation Controversy), title pages: "All quotations of Scripture in this book are taken from the Revised Standard Version - [Second] Catholic Edition unless otherwise noted". ^ "Liturgy". www.usccb.org. Retrieved 2017-05-12. This page was last edited on 16 February 2019, at 02:31 (UTC).